Most of the figures that stand out in history, do so through some exceptional personal quality, good or bad, that makes them more significant than their fellows. But there was born at Ghent in Belgium in 1500 a man of commonplace abilities and melancholy temperament, the son of a mentally defective mother who had been married for reasons of state, who was through no fault of his own to become the focus of the accumulating stresses of Europe. The historian must give him a quite unmerited and accidental prominence side by side with such marked individualities as Alexander and Charlemagne and Frederick II. This was the Emperor Charles V. For a time be had an air of being the greatest monarch in Europe since Charlemagne. Both he and his illusory greatness were the results of the matrimonial statecraft of his grandfather, the Emperor Maximilian I (born 1459, died 1519). Some families have fought, others have intrigued their way to world power; the Habsburg married their way. Maximilian began his career with the inheritance of the Habsburgs, Austria, Styria, part of Alsace and other districts; he married the lady’s name scarcely matters to us-the Netherlands and Burgundy. Most of Burgundy slipped from him after his first wife’s death, but the Netherlands he held. Then he tried unsuccessfully to marry Brittany. He became Emperor in succession to his father, Frederick III, in 1493, and married the duchy of Milan. Finally he married his son to the weak minded daughter of Ferdinand and Isabella, the Ferdinand and Isabella of Columbus, who not only reigned over a freshly united Spain, and over Sardinia and the kingdom of the two Sicilies, but by virtuue of the papal gifts to Castile, over all America west of Brazil. So, it was that Charles, his grandson, inherited most of the American continent and between a third and a half of what the Turks had left of Europe. The father of Charles died in 1506, and Maximilian did his best to secure his grandson’s election to the imperial throne. Charles succeeded to the Netherlands in 1506; he became practically king of the Spanish dominions, big mother being imbecile, when his grandfather Ferdinand died in 1516; and his grandfather Maximilian dying in 1519, he was in 1520 elected Emperor at the still comparatively tender age of twenty. His election as Emperor was opposed by the young and brilliant French King, Francis I, who had succeeded to the French throne in 1515 at the age of twenty-one. The candidature of Francis was supported by Leo X (1513), who also requires from us the epithet brilliant. It was indeed an age of brilliant monarchs. It was the age of Baber in India (1526-1530) and Suleiman in Turkey (1520). Both Leo and Francis dreaded the concentration of so much power in the hands of one man as the election of Charles threatened. The only other monarch who seemed to matter in Europe was Henry VIII, who had become King of England in 1509 at the age of eighteen. He also offered himself as a candidate for the empire, and the imaginative English reader may amuse himself by working out the possible consequences of such an election. There was much scope for diplomacy in this triangle of kings. Charles on his way from Spain to Germany visited England and secured the support of Henry against Francis by bribing his minister, Cardinal Wolsey. Henry also made a great parade of friendship with Francis; there was feasting, tournaments, and such-like antiquated gallantries in France, in a courtly picnic known to historians as the Field of the Cloth of Gold (1520). Knighthood was becoming a picturesque affectation in the sixteenth century. The Emperor Maximilian I is still called «the last of the knights» by German historians. The election of Charles was secured, it is to be noted, by a vast amount of bribery. He had as his chief supporters and creditors the great German business house of the Fuggers. That large treatment of money and credit which we call finance, which had gone out of European political life with the collapse of the Roman Empire, was now coming back to power. This appearance of the Fuggers, whose houses and palaces outshone those of the emperors, marks the upward movement of forces that had begun two or three centuries earlier in Cahors in France and in Florence and other Italian towns. Money, public debts, and social unrest and discontent re-enter upon the miniature stage of this Outline. Charles V was not so much a Habsburg as a Fugger emperor. For a time this fair, not very intelligent-looking young man with the thick upper lip and long, clumsy chin-features which still afflict his descendants-was largely a puppet in the hands of his ministers. Able servants after the order of Machiavelli guided him at first in the arts of kingship. Then in a slow but effectual way he began to assert himself. He was confronted at the very outset of his reign in Germany with the perplexing dissensions of Christendom. The revolt against the papal rule which had been going on since the days of Huss and Wycliffe had been recently exasperated by a new and unusually cynical selling of indulgences to raise money for the completion of St. Peter’s at Rome. 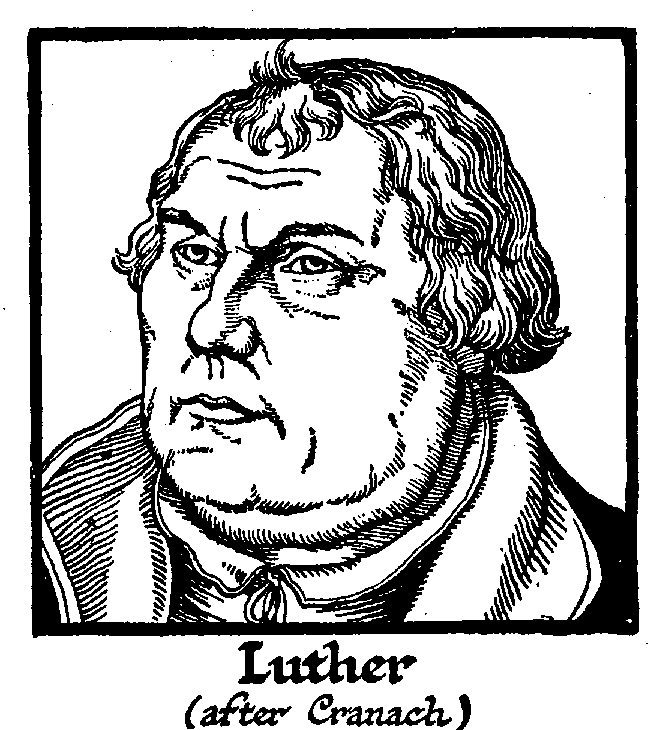 A monk named Luther, who had been consecrated as a priest, who had taken to reading the Bible, and who, while visiting Rome on the business of his order, had been much shocked by the levity and worldly splendour of the Papacy, had come forward against these papal expedients at Wittenberg (1517), offering disputation and propounding certain theses. An important controversy ensued. At first Luther carried on this controversy in Latin, but presently took to German, and speedily had the people in a ferment. Charles found this dispute raging when he came from Spain to Germany. He summoned an assembly or «diet» of the empire at Worms on the Rhine. To this, Luther, who had been asked to recant his views by Pope Leo X, and who had refused to do so, was summoned. Ile came, and, entirely in the spirit of Huss, refused to recant unless he was convinced of his error by logical argument or the authority of Scripture. But his protectors among the princes were too powerful for him to suffer the fate of John Huss. Here was a perplexing situation for the young Emperor. There is reason to suppose that he was inclined at first to support Luther against the Pope. 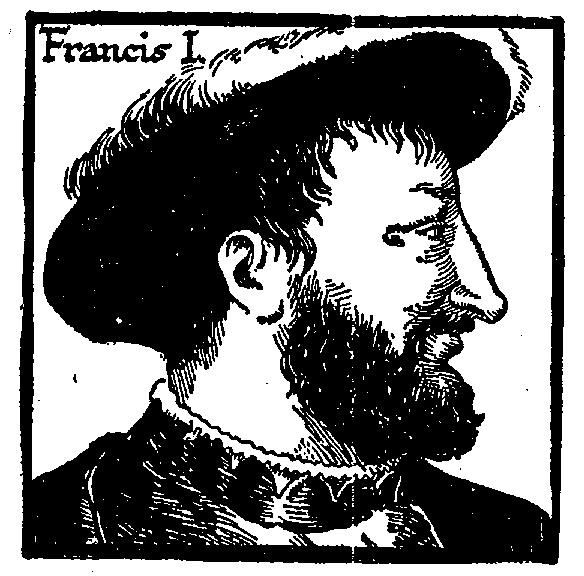 Leo X had opposed the election of Charles, and was friendly with his rival, Francis I. 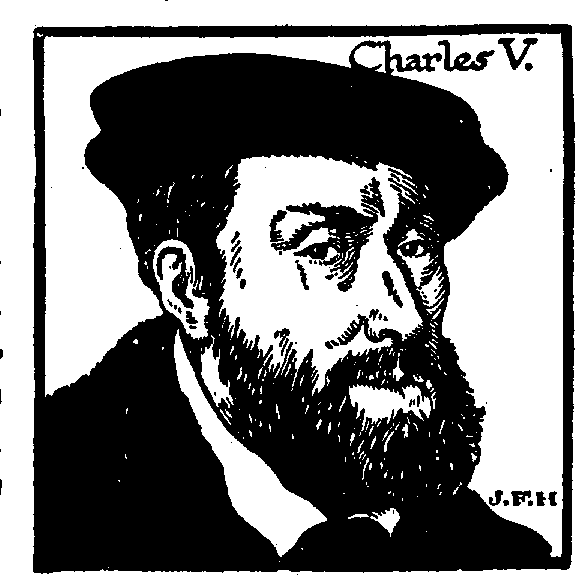 But Charles V was not a good Machiavellian, and he had acquired in Spain a considerable religious sincerity. He decided against Luther. Many of the German princes, and especially the Elector of Saxony, sided with the reformer. Luther went into hiding under the protection of the Saxon Elector, and Charles found himself in the presence of the opening rift that was to split Christendom into two contending camps. Close upon these disturbances, and probably connected with them, came a widespread peasants’ revolt throughout Germany. This outbreak frightened Luther very effectually. He was shocked by its excesses, and from that time forth the Reformation he advocated ceased to be a Reformation according to the people and became a Reformation according to the princes. He lost his confidence in that free judgment for which he had stood up so manfully. Meanwhile Charles realized that his great empire was in very serious danger both from the west and from the east. On the west of him was his spirited rival, Francis I; to the east was the Turk in Hungary, in alliance with Francis and clamouring for certain arrears of tribute from the Austrian dominions. Charles had the money and army of Spain at his disposal, but it was extremely difficult to get any effective support in money from Germany. His grandfather had developed a German infantry on the Swiss model, very much upon the lines expounded in Machiavelli’s Art of ‘War, but these troops had to be paid and his imperial subsidies had to be supplemented by unsecured borrowings, which were finally to bring his supporters, the Fuggers, to ruin. 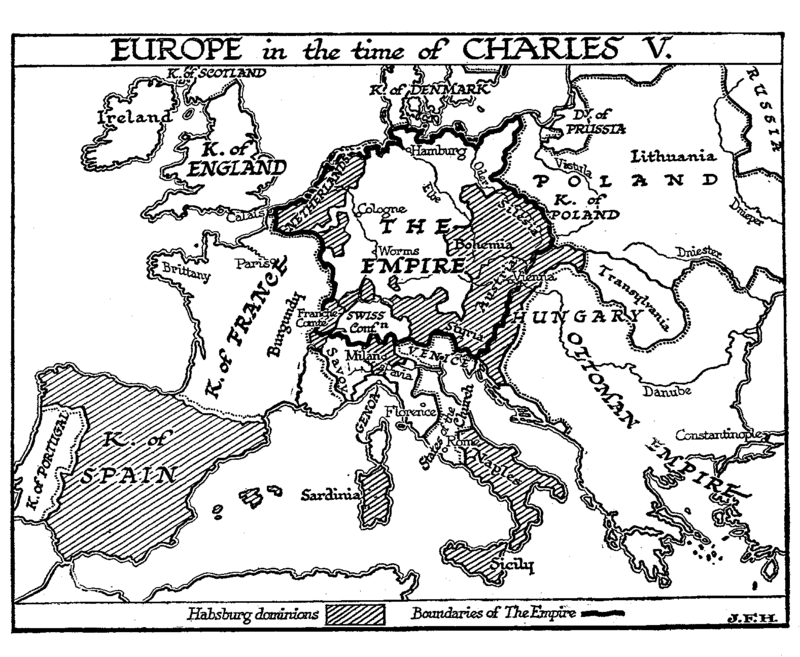 On the whole, Charles, in alliance with Henry VIII, was successful against Francis I and the Turk. Their chief battlefield was north Italy; the generalship was dull on both sides; their advances and retreats depended chiefly on the arrival of reinforcements. The German army invaded France, failed to take Marseilles, fell back into Italy, lost Milan, and was besieged in Pavia. Francis I made a long and unsuccessful siege of Pavia, was caught by fresh German forces, defeated, wounded, and taken prisoner. He sent back a message to his queen that all was «lost but honour», made a humiliating peace, and broke it as soon as he was liberated, so that even the salvage of honour was but temporary. Henry VIII and the Pope, in obedience to the rules of Machiavellian strategy, now went over to the side of France in order to prevent Charles becoming too powerful. The German troops in Milan, under the Constable of Bourbon, being unpaid, forced rather than followed their commander into a raid upon Rome. They stormed the city and’ pillaged it (1527). The Pope took refuge in the Castle of St. Angelo while the looting and slaughter went on. He bought off the German troops at last by the payment of four hundred thousand ducats. Ten years of such stupid and confused fighting impoverished all Europe and left the Emperor in possession of Milan. In 1530 he was crowned by the Pope-he was the last German Emperor to be crowned by the Pope-at Bologna. One thinks of the rather dull-looking blonde face, with its long lip and chin, bearing the solemn expression of one who endures a doubtful though probably honourable ceremony. Meanwhile the Turks were making great headway in Hungary. They had defeated and killed the King of Hungary in 1526, they held Buda-Pesth, and in 1529, as we have already noted, Suleiman the Magnificent very nearly took Vienna. The Emperor was greatly concerned by these advances, and did his utmost to drive back the Turks, but he found the greatest, difficulty in getting the German princes to unite even with this formidable enemy upon their very borders. Francis I remained implacable for a time, and there was a now French war; but in 1538 Charles won his rival over to a more friendly attitude by ravaging the south of France. Francis and Charles then formed an alliance against the Turk, but the Protestant princes, the German princes who were resolved to break away from Rome had formed a league, the Schmalkaldic League (named after the little town of Schmalkalden in Hesse, at which its constitution was arranged), against the Emperor, and in the place of a great campaign to recover Hungary for Christendom Charles had to turn his mind to the gathering internal struggle in Germany. Of that struggle he saw only the opening war. It was a struggle, a sanguinary irrational bickering of princes for ascendancy, now flaming into war and destruction, now sinking back to intrigues and diplomacies; it was a snake’s sack of Machiavellian policies, that was to go on writhing incurably right into the nineteenth century, and to waste and desolate Central Europe again and again. The Emperor never seems to have grasped the true forces at work in these gathering troubles. He was for his time and station an exceptionally worthy man, and he seems to have taken the religious dissensions that were tearing Europe into warring fragments as genuine theological differences. He gathered diets and councils in futile attempts at reconciliation. Formulae and confessions were tried over. The student of German history must struggle with the details of the Religious Peace of Nuremberg, the settlement at the diet of Ratisbon, the Interim of Augsburg, and the like. Here we do but mention them as details in the worried life of this culminating emperor. As a matter of fact, hardly one of the multifarious princes and rulers in Europe seems to have been acting in good faith. The wide-spread religious trouble of the world, the desire of the common people for truth and social righteousness, he spreading knowledge of the time all those things were merely counters in the imaginations of princely diplomacy. 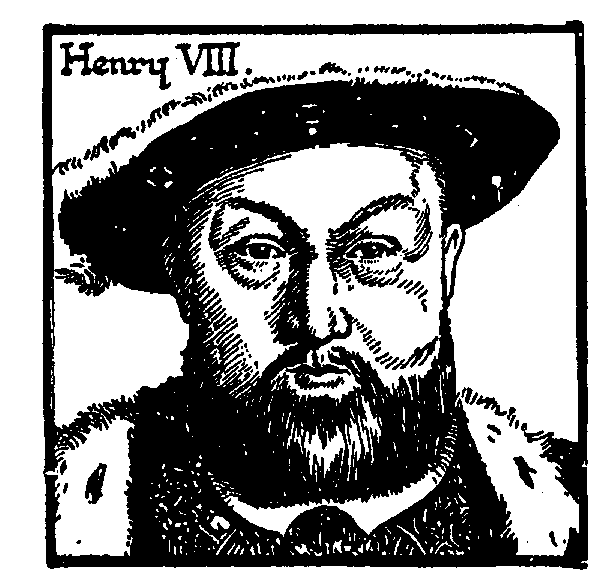 Henery VII of England, who had begun his career with a book written against heresy, and who had been rewarded by the Pope with the title of «Defender of the Faith», being anxious to divorce his first wife in favour of an animated young lady named Anne Boleyn, and wishing also to turn against the Emperor in favour of Francis I and to loot the vast wealth of the church in England, joined the company of Protestant princes in 1530. Sweden, Denmark, and Norway had already gone over to the Protestant side. The German religious war began in 1546, a few months after the death of Martin Luther. We need not trouble about the incidents of the campaign. The Protestant Saxon army was badly beaten at Lochau. By something very like a breach of faith Philip of Hesse, the Emperor’s chief remaining antagonist, was caught and imprisoned, and the Turks were bought off by the payment of an annual tribute. In 1547, to the great relief of the Emperor, Francis I died. So by 1547 Charles got to a kind of settlement, and made his last efforts to effect peace where there was no peace. In 1552 all Germany was at war again, only a precipitate flight from Innsbruck saved Charles from capture, and in 1552, with the treaty of Passau, came another unstable equilibrium. Charles was now utterly weary of the cares and splendours of empire; he had never had a very sound constitution, he was naturally indolent, and he was suffering greatly from gout. He abdicated. He made over all his sovereign rights in Germany to his brother Ferdinand, and Spain and the Netherlands he resigned to his son Philip. He then retired to a monastery at Yuste, among the oak and chestnut forests in the hills to the north of the Tagus valley, and there he died in 1568. Much has been written in a sentimental vein of this retirement, this renunciation of the world by this tired majestic Titan, world-weary, seeking in an austere solitude his peace with God. But his retreat was neither solitary nor austere; he had with him nearly a hundred and fifty attendants; his establishment had all the indulgences without the fatigues of a court, and Philip II was a dutiful son to whom his father’s advice was a command. As for his austerities, let Prescott witness: «In the almost daily correspondence between Quixada, or Gaztelu, and the Secretary of State at Valladolid, there is scarcely a letter that does not turn more, or less on the Emperor’s eating or his illness. The one seems naturally to follow, like a running commentary, on the other. It is rare that such topics have formed the burden of communications with the department of state. It must have been no easy matter for the secretary to preserve his gravity in the perusal of despatches in which politics and gastronomy were so strangely mixed together. The courier from Valladolid to Lisbon was ordered to make a detour, so as to take Jarandilla in his route, and bring supplies for the royal table. On Thursdays he was to bring fish to serve for the jour maigre that was to follow. The trout in the neighbourhood Charles thought too small; so others, of a larger size, were to be sent from Valladolid. Fish of every kind was to his taste, as indeed, was anything that in its nature or habits at all approached to fish. Eels, frogs, oysters, occupied an important place in the royal bill of fare. Potted fish, especially anchovies, found great favour with him; and he regretted that he had not brought a better supply of these from the Low Countries. On an eel-pasty be particularly doted. . . . In 1554 Charles had obtained a bull from Pope Julius III granting him a dispensation from fasting, and allowing him to break his fast early in the morning even when he was to take the sacrament. «That Charles was not altogether unmindful of his wearing apparel in Yuste, may be inferred from the fact that his wardrobe contained no less than sixteen robes of silk and velvet, lined with ermine, or eider down, or the soft hair of the Barbary goat. As to the furniture and upholstery of his apartments, how little reliance is to be placed on the reports so carelessly circulated about these may be gathered from a single glance at the inventory of his effects, prepared by Quixada and Gaztelu soon after their master’s death. Among the items we find carpets from Turkey and Alcarez, canopies of velvet and other stuffs, hangings of fine black -cloth, which since his mother’s death he had always chosen for his own bedroom; while the remaining apartments were provided with no less than twenty-five suits of tapestry, from the looms of Flanders, richly embroidered with figures of animals and with landscapes»… . «Among the different pieces of plate we find some of pure gold, and others especially noted for their curious workmanship; and as this was an age in which the art of working the precious metals was carried to, the highest perfection, we cannot doubt that some of the finest specimens had come into the Emperor’s possession, The whole amount of plate was estimated at between twelve and thirteen thousand ounces, in weight»… . Charles had never acquired the habit of reading, but be would be read aloud to at meals after the fashion of Charlemagne, and would make what one narrator describes as a «sweet and heavenly commentary». He also amused himself with technical toys, by listening to music or sermons, and by attending to the imperial business that still came drifting in to him. The death of the Empress, to whom he was greatly attached, had turned his mind towards religion, which in his case took a punctilious and ceremonial form; every Friday in Lent he scourged himself with the rest of the monks with such good will as to draw blood. These exercises and the gout released a bigotry in Charles that had-been hitherto restrained by considerations of policy. The appearance of Protestant teaching close at hand in Valladolid roused him to fury. «Tell the grand inquisitor and his council from me to be at their posts, and to lay the axe at the root of the evil before it spreads further»… . He expressed a doubt whether it would not be well, in so black an affair, to dispense with the ordinary course of justice, and to show no mercy; «lest the criminal, if pardoned, should have the opportunity of repeating his crime». He recommended, as an example, his own mode of proceeding in the Netherlands, «where all who remained obstinate in their errors were burned alive, and those who were admitted to penitence were beheaded». Among the chief pleasures of the Catholic monarch between meals during this time of retirement were funeral services. He not only attended every actual funeral that was celebrated at Yuste, but he had services conducted for the absent dead, he held a funeral service in memory of his wife on the anniversary of her death, and finally he celebrated his own obsequies. «The chapel was hung with black, and the blaze of hundreds of wax-lights was scarcely sufficient to dispel the darkness. The brethren in their conventual dress, and all the Emperor’s household clad in deep mourning, gathered round a huge catafalque, shrouded also in black, which had been raised in the centre of the chapel. The service for the burial of the dead was then performed; and amidst the dismal wail of the monks, the prayers ascended for the departed spirit that it might be received into the mansions of the blessed. The sorrowful attendants were melted to tears, as the image of their master’s death was presented to their minds-or they were touched, it maybe, with compassion by this pitiable display of weakness. Charles, muffled in a dark mantle, and bearing a lighted candle in his hand, mingled with his household, the spectator of his own obsequies; and the doleful ceremony was concluded by his placing the taper in the hands of the priest, in sign of his surrendering up his soul to the Almighty». Other accounts make Charles wear a shroud and lie in the coffin, remaining there alone until the last mourner had left the chapel. Within two months of this masquerade he was dead. And the greatness of the Holy Roman Empire died with him. The Holy Roman Empire struggled on indeed to the days of Napoleon, but as an invalid and dying thing. But he had a better reason for doing this in the fact that there was no heir to the throne. The Wars of the Roses, a bitter dynastic war, were still very vivid in the minds of English people. —F. I. L. H.
 Prescott’s Appendix to Robertson’s History of Charles V .